David Whyte’s earlier book, The Heart Aroused, is a favourite of mine so I looked forward to reading this one, published in January 2009. In it he gives us a new take on work-life balance, writing about the way most approaches to this elusive quality lead us to two undo-able and often opposing agendas (of course it’s not meant to happen that way, but I agree, it’s pretty much what happens). Instead he looks at our longing to meet both personal and work demands and says it’s really more like a three-strand rope to weave than something to balance. Work, relationship and self are intertwined and need to be understood that way rather than as separate areas competing for our attention and time. 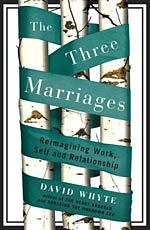 He’s a good story teller and illustrates this perspective by exploring the lives of some great writers (Dante, Jane Austen, Robert Louis Stevenson) and the way their commitment to work, self and relationship informed their lives and work. It’s a poet’s call to go after the deeper satisfaction you seek in your life together with meaningful direction on accomplishing this; the writing is lovely and persuasive.